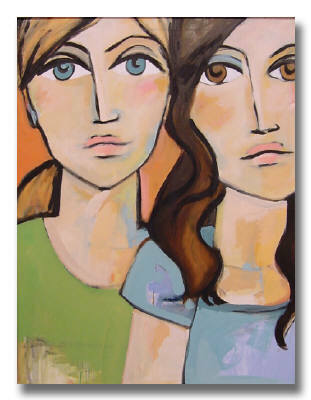 Two Girls #6, oil on canvas, 40" x 30"
Bekah Ash paints fictional characters with oils on canvas. Each piece begins with a charcoal drawing on the canvas to help her get a feel for the character and composition. This drawing serves as a foundation for each painting, but doesn't often make it to completion. Usually the first painting won't work out, in which case, Ash will begin a new drawing directly on top of the old, resulting in different layers of under painting showing through the finished top layer. This relationship between the layers of paint ironically adds another level to what is already happening with the characters in her work. Ash has always been interested in human interaction, and her paintings are an outlet to tell stories and create a variety of characters to act them out. She uses subtle facial expressions, or the complete lack of, along with color and composition, to convey an emotion she has had, or a memory of a relationship, or a scenario she has completely made up that might be good or bad. While Ash is recording a personal situation or emotion, her paintings are ambiguous, allowing the viewer to form an individual conclusion about each piece. Different people may experience similar situations in completely different ways; some may identify with certain colors or color combinations, or simply recognize a friend or enemy in a painting, and Ash embraces that individuality in her work. As soon as a piece leaves the studio these human relationships become important on a more playful level as a painting starts its own relationship with everyone who sees it. It is important to Ash that this interaction between the painting and viewer is not influenced in any way, so most of her titles are generic observations used only to identify a piece. Bekah Ash received a B.A. in Art Education from the University of Iowa.